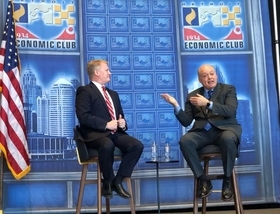 Speaking at the Detroit Economic Club, Hackett reiterated that 2019 will be a "year of execution," a phrase he's used since describing 2018 as disappointing in a year-end letter to employees. The automaker made $7 billion last year with a profit margin of 4.4 percent, down from 6.1 percent in 2017. Hackett has instituted an $11 billion global restructuring at Ford that includes a transformation of its product portfolio and cuts to its salaried work force. In North America, the automaker expects to eventually hit 10 percent profit margins. But investors and analysts remain skeptical. Ford's stock price has fallen 16 percent since Hackett took over. The automaker also is working on development of autonomous vehicles, which Hackett said will be ready by 2021.